The Lollipop Farm Train is running on Saturdays at the John Gardiner Farm from 10am-2pm. 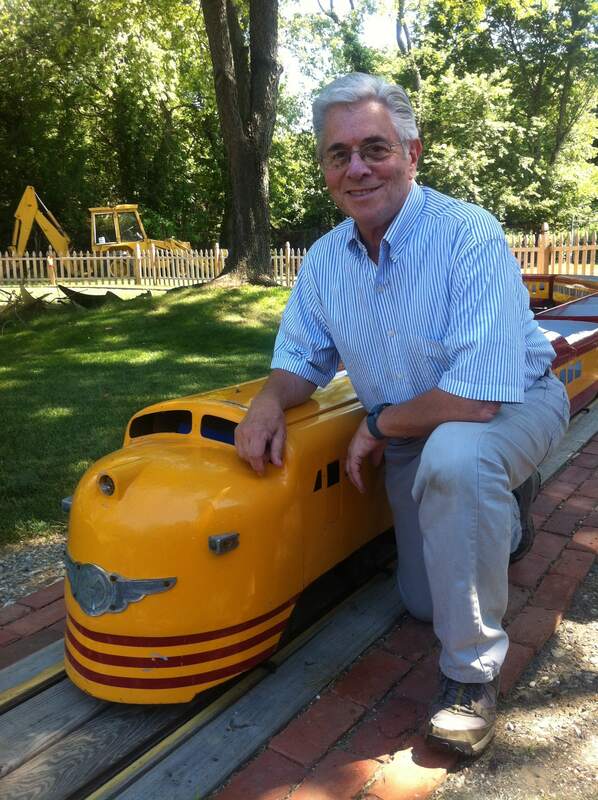 Charlie Weidig, an original Lollipop Farm Train engineer from 1960, makes appearances when available. Charlie's summer job was driving the train when he was a teenager! Stop by and meet Charlie. 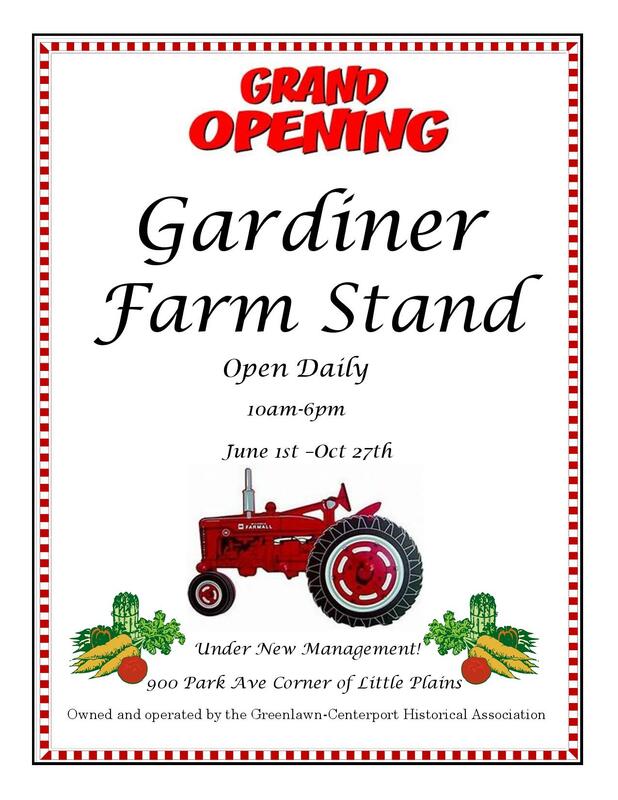 The Farm stand at the John Gardiner Farm will reopen 10 am-PM starting June 1. We will be offering fresh local vegetables at the farm daily. And don't miss seeing all this and much more at September's Pickle Festival! Our exhibit “Broadway in Greenlawn”, A Walk Down Memory Lane is now up at the Harborfields Public Library. The exhibit can be found in the study room, which is located across from the reference desk. It will be up throughout the summer. We invite everyone to see it. The area, originally known as Oldfields, was settled in the early 1800’s by farmers. The extension of the Long Island Railroad through the farmlands in 1867-1868, provided the impetus for the development of a profitable pickle and cabbage industry, as well as the growth of the community and many new year-round residents. The little community that grew around the depot developed its own identity and changed its name to Greenlawn. Today, houses cover the old farmlands and yet Greenlawn, with one main street of small shops, a railroad crossing that halts traffic throughout the day and many historical buildings, still retains its small-town charm. The GCHA is a non-profit membership organization with a mission to research, collect, record and preserve the history of the communities of Greenlawn and Centerport, Long Island, New York. 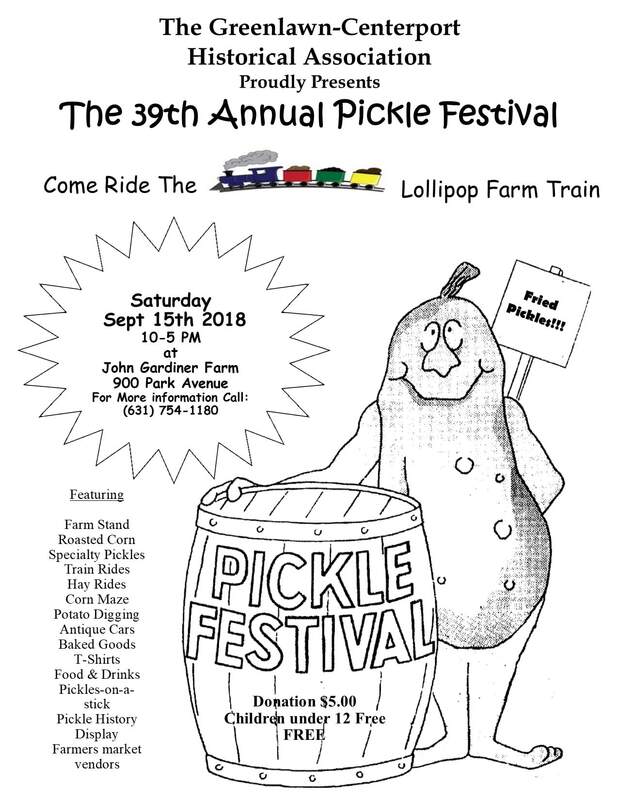 39th Annual PICKLE FESTIVAL! 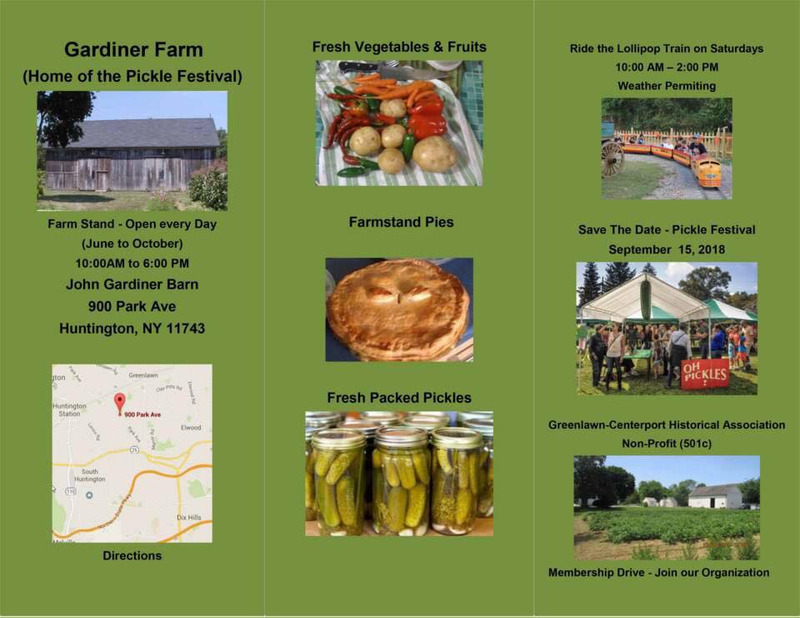 September 15, 2018, 10.00am-4.00pm at John Gardiner Farm.